Best wishes for a wonderful, peaceful and beautiful 2011 ! Our offices will be closed from from 24 December to 7 January included. An information portal on the pan-European markets and comparative data is under construction. Our members have engaged in international activities, we have organised a Brussels’ Week for our members to get to know EU’s functioning better, have started developing new internal communication tools, have concluded a first commercial partnership with EuroKaution and distributed the first two guides for professionals across Europe concerning the energy performance requirements and procedures to be followed by those wishing to engage in cross-border work. Much more is in the pipeline for the new year; Rendez-vous in 2011 ! 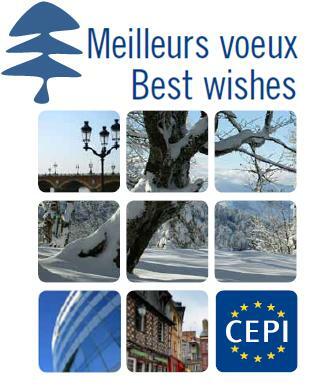 Please note that CEPI offices will be closed from 24 December to 7 January included.